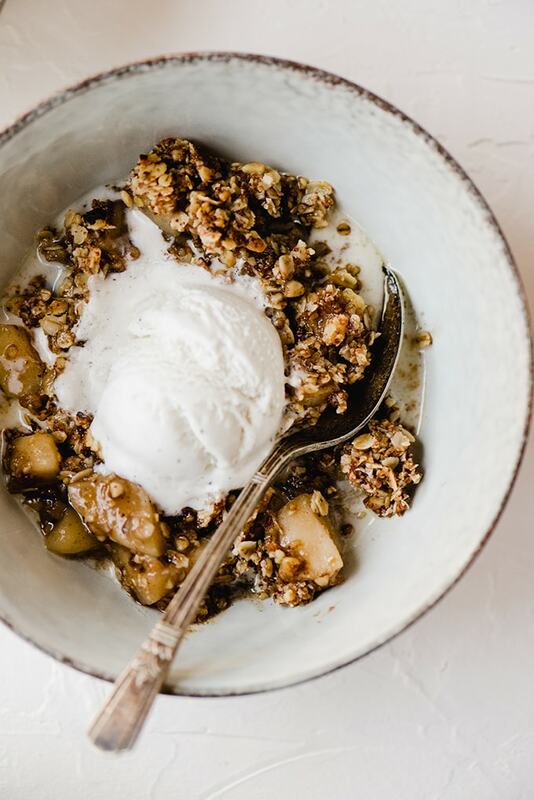 This gluten free apple crisp is a lightened up and refined sugar free version of the Thanksgiving classic! 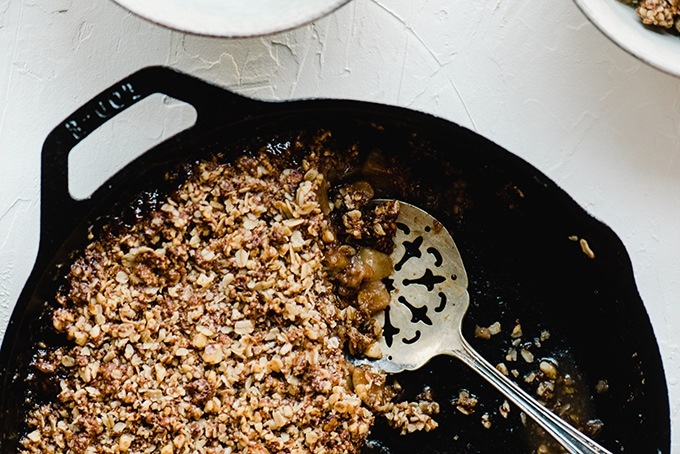 It’s sweetened with maple syrup and coconut sugar, and topped with gluten free oats, pecans, and walnuts. It’s made start to finish in a cast iron skillet resulting in an equally tender and crisp texture. This is a healthy(ish) fall dessert recipe that will satisfy even the pickiest sweet tooth around your table. 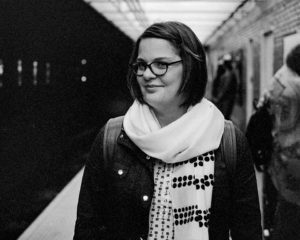 I love how intimately food is woven into my most cherished memories and shared histories. For the majority of high school, I shared much of my free time with a gang of four close friends. We spent our wild teenage nights at the bowling alley, “cruising” around town, and occasionally hitting up the local pool hall (gasp!). I’m telling you, we lived the fast life. I carry distinct food memories from those times – gelati from Rita’s (vanilla custard and cherry ice for life), Skittles (don’t ask), Jersey pizza (‘natch), and homemade apple crisp. For the latter, we carried on a tradition well into our college years (and even a few beyond) of gathering at our friend’s house on Thanksgiving night and indulging in giant bowls of his mom’s homemade apple crisp. It’s a tradition that eventually outlived practical realities, but ahhh, the memories. 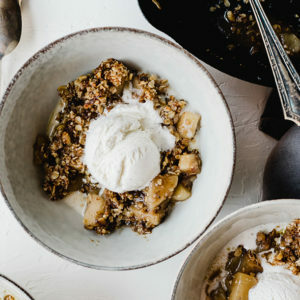 To this day they bring on ooey, gooey buckets of nostalgia – just like this gluten free apple crisp. 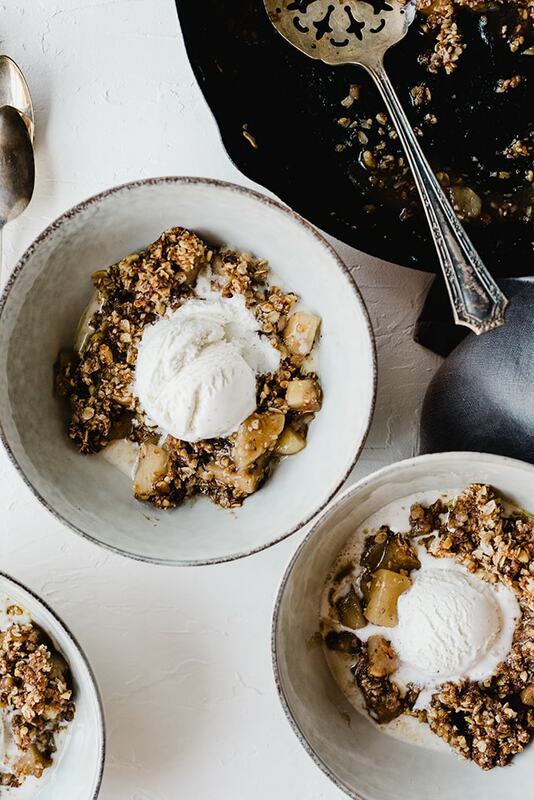 Since I’m no longer a young 20-something who can shovel buckets of sugar into her piehole without gaining 10 pounds overnight, this version of apple crisp is gluten free, lightened up, and completely refined sugar free. We’re still making our way through a massive apple haul from Catoctin Mountain Orchard, so I had plenty of Jonagolds for this recipe. 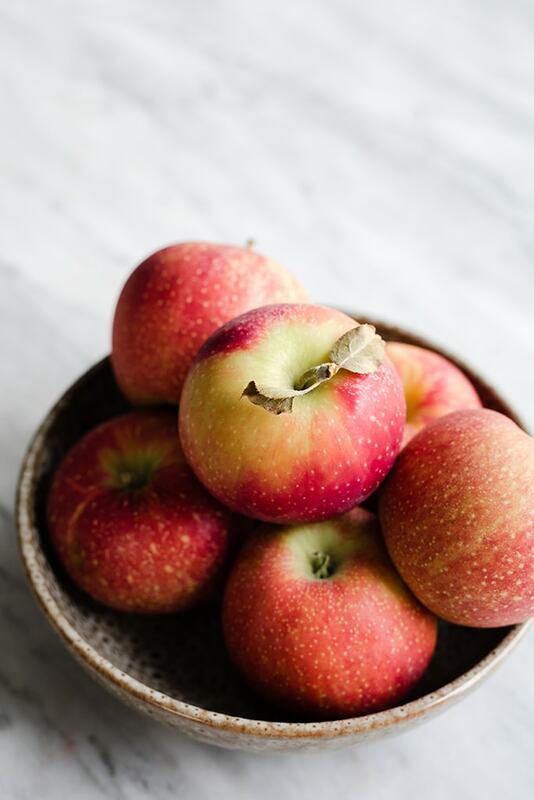 They’re a terrific baking apple – sweet and tart with firm flesh that holds up well in a hot oven. Other great baking apples include fuji, gala, granny smith (way more tart), honey crisp, and pink lady. 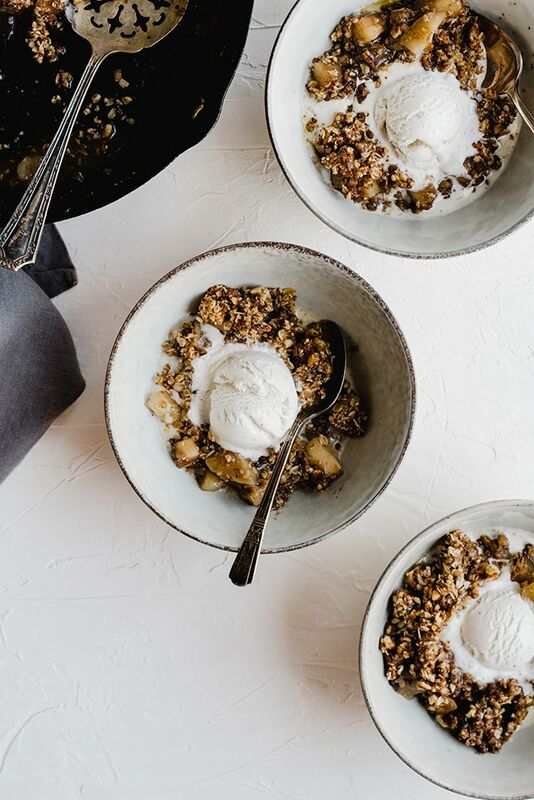 For this recipe, I peel and core the apples, then dice into 1/2″ pieces – just the right size for scooping nice heaps of golden apple crisp with a spoon from a bowl and into your face. 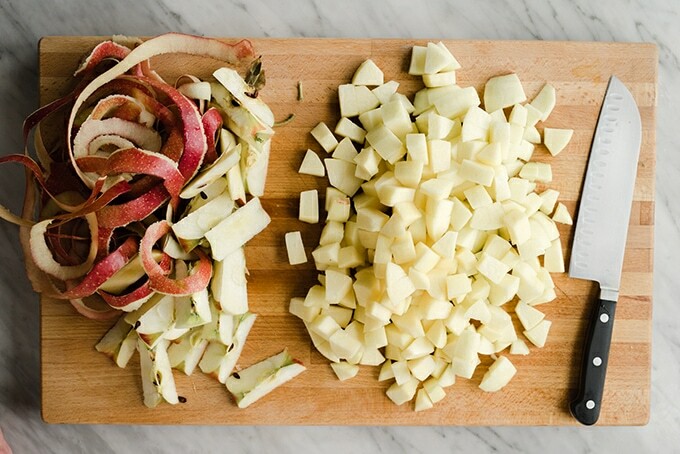 You don’t have to peel the apples (and it will save you a little prep time if you don’t). But I have a…particular…child who wouldn’t dream of eating a baked apple with the skin on (although he happily munches on raw apples with skin on daily. Kid logic). 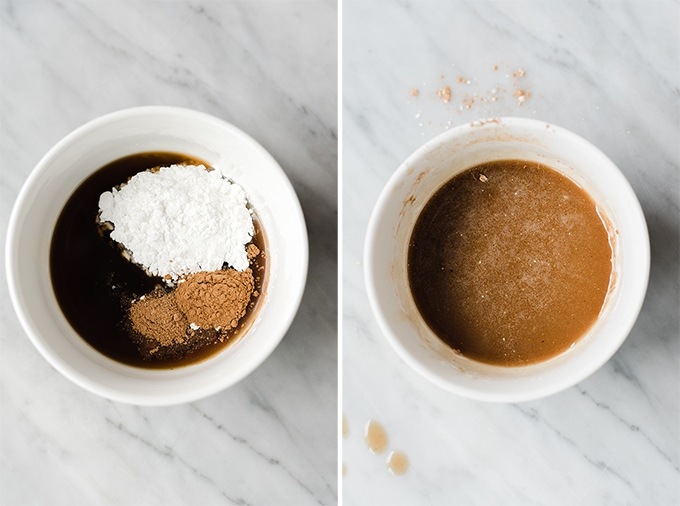 To keep this recipe sweet, yet relatively healthy, I substitute the traditional white and brown sugars for pure maple syrup and coconut palm sugar, respectively. Coconut palm sugar is made from sap that’s been extracted from the coconut palm (flower). The sap is then dehydrated into crystals. I don’t totally hate on sugar (evidence, evidence) but I do try to avoid it most of the time and I’ve found coconut sugar to be an excellent 1:1 substitute for both white and brown sugar. It’s not a miracle food, and it still isn’t terrific for you (so don’t go around eating buckets of it), but it’s processed more naturally than traditional refined sugars, retains some trace minerals, and is marginally “healthier”. Mostly I prefer coconut sugar because it’s a heck of a lot more sustainable and environmentally friendly than sugar cane. As for the maple syrup? ‘Tis the season for maple y’all (and I can source it locally for a really great price). The gluten free apple crisp topping is half gluten-free oats and half nuts, along with the coconut sugar. I like pecans and walnuts, but almonds are also an excellent choice. I reach for my food processor to prepare the topping, and the process is super fast and easy. After making the gluten free topping and popping it into the fridge to (literally) chill out for a bit, I sauté the apples in some butter in my (you guessed it!) favorite 10″ Lodge cast iron skillet. 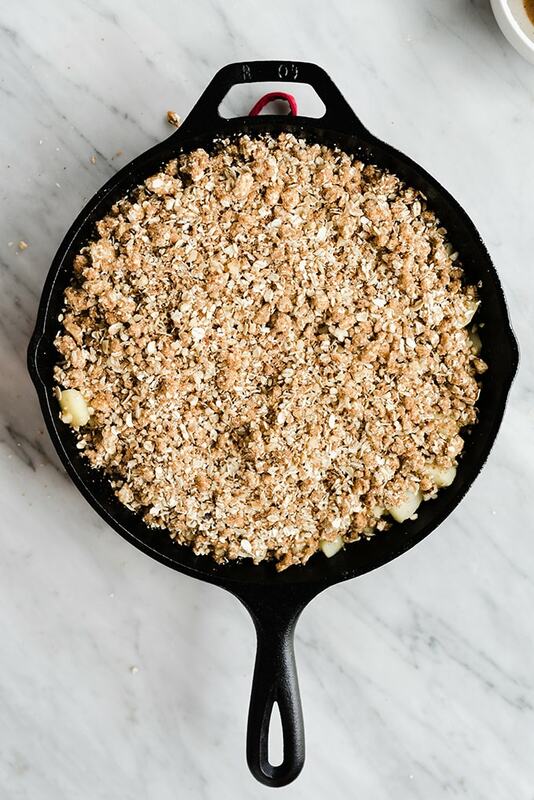 I like giving my apples a head start on the stove (and some extra buttery love), so making the whole crisp start to finish in a cast iron skillet means I don’t have to dirty an extra dish. Also, it’s a pretty presentation. Also, the cast iron retains the heat well, so the apples keep their heat from stovetop to oven for a pretty seamless cooking process. 40 or so minutes later? 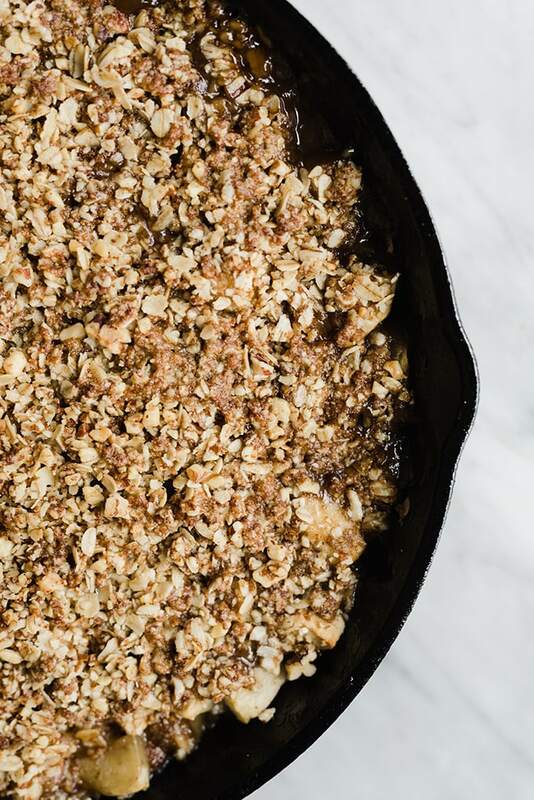 Ooey, gooey, gluten-free apple crisp. Best served warm, topped with vanilla ice cream. 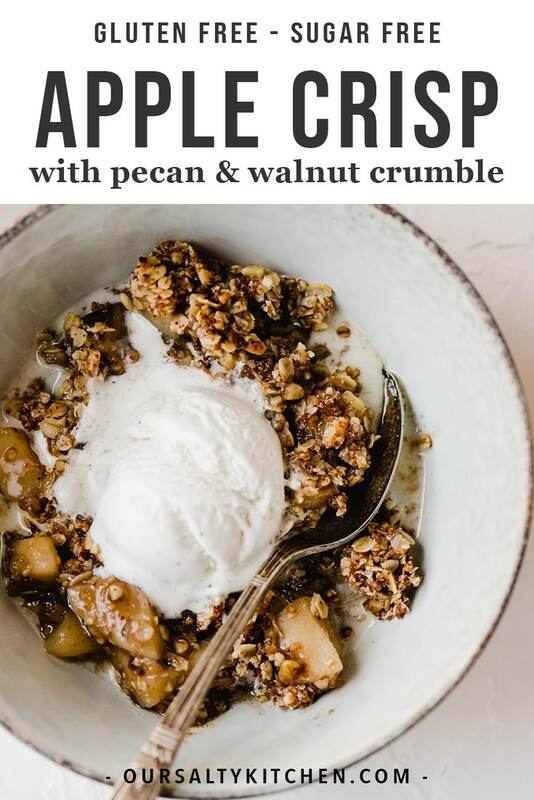 This gluten free apple crisp is a lightened up and refined sugar free version of the Thanksgiving classic! It's made start to finish in a cast iron skillet resulting in an equally tender and crisp texture. This is a healthy fall dessert recipe that will satisfy even the pickiest sweet tooth around your table. Prepare the topping. 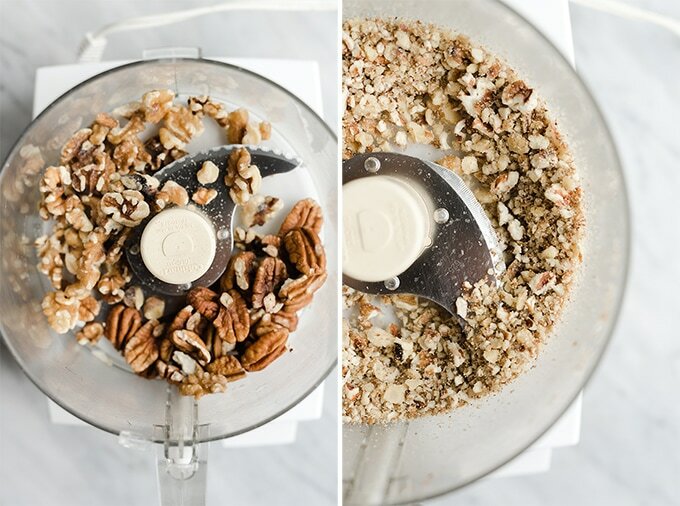 Place the nuts in the well of a food processor and pulse until crumbled. 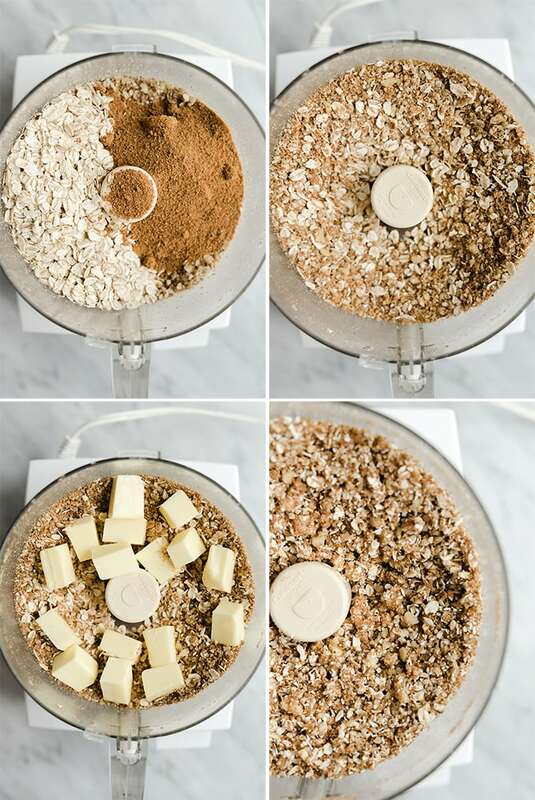 Add the oats and sugar and pulse just to combine. Add the butter and pulse until coarse crumbs form. Place the topping in the fridge while you prepare the rest of the ingredients. In a separate bowl, whisk the maple syrup, cornstarch, vanilla, cinnamon, and nutmeg. Set aside. Peel, core, and dice the apples into 1/2" pieces. Place a skillet over medium high heat. Add the butter and heat until it melts. 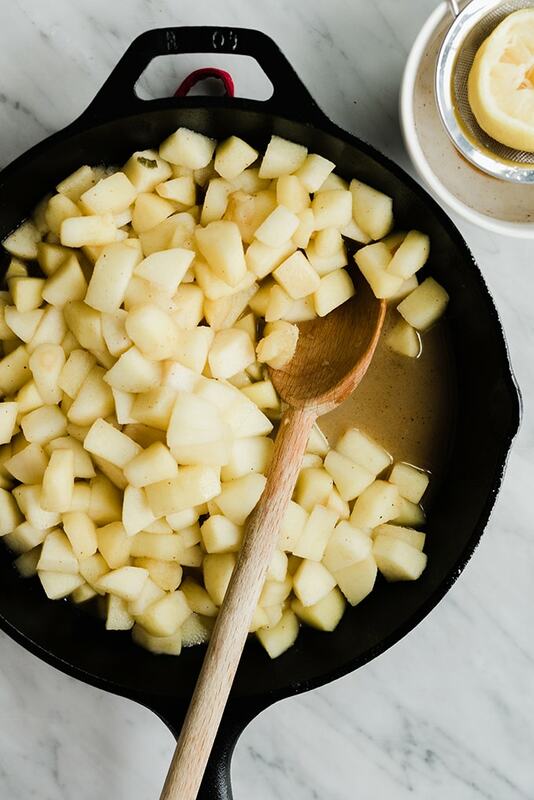 Add the apples and cook, stirring occasionally, until they start to release their juices and soften, 8-10 minutes. Add the maple syrup mixture to the skillet and stir to coat. Remove from heat and stir in the lemon juice. Remove the gluten free topping from the fridge and sprinkle evenly over the the apple. Bake until the topping is golden brown and the filling is bubbling around the edges, 45 minutes.